Do they make a difference in input lag and image quality? I got a 75hz IPS 7ms GtG panel from Viewsonic that I'm temporarily using till I get a higher refresh rate monitor, so I want to make it the best experience possible. Re: Large VT tweak on 60/75hz panels? A VT increase of 10 is not going to do anything. RealNC wrote: A VT increase of 10 is not going to do anything. How much of a VT increase is noticable and worth doing? TL;DR: A VT increase of 10 is like a drop of water in the ocean It doesn't do anything. I rate this topic Pandora Box because it's university-level Blur Busters refresh rate physics! See Advanced Quick Frame Transport thread. Behind the scenes, new HDMI 2.1 specification actually use Large Vertical Totals to pull off Quick Frame Transport. It's essentially the same kind of thing; faster scanout over the cable followed by longer pauses (Bigger VBIs) between scanouts. Now, what we're doing here is effectively a difficult kind of homebrew QFT. Don't try it unlss you're already a ToastyX Expert (or can easily learn it -- e.g. a computer programmer experienced in Raster Interrupts), it's almost like Calculus 101. Just stick to capped FreeSync or capped G-SYNC, that's a much easier method that does pretty much equivalent results. To double the refresh cycle delivery speed, you need to double your Vertical Total. VBI is only a tiny part of a refresh cycle, usually approximately 5% or less. So adding 10 to your vertical total will not really help. Imagine a video cable as an infinite stream of pixel rows (being transmitted continuously at the full Horizontal Scan Rate or Horizontal Refresh Rate in Kilohertz (KHz) -- scan lines per second). It's like 1080 rows of visible pixel rows and 45 dummy pixel rows separating the old/new refresh cycle. Most monitors cannot do such large VTs except at their lower refresh rates. For example, a 240Hz monitor can gain a custom resolution tweak that creates a 120Hz mode with a 2x frame delivery acceleration factor, or a 60Hz mode with a 4x frame delivery acceleration factor. FreeSync monitors are much more friendly to Quick Frame Transport tricks, but it's just simply much easier to use a 60fps or 120fps cap on a 240Hz FreeSync monitor -- much easier QFT for less work. Low-caps-on-high-Hz VRR is already a "defacto QFT'" system. (B) Understand this mathematically. 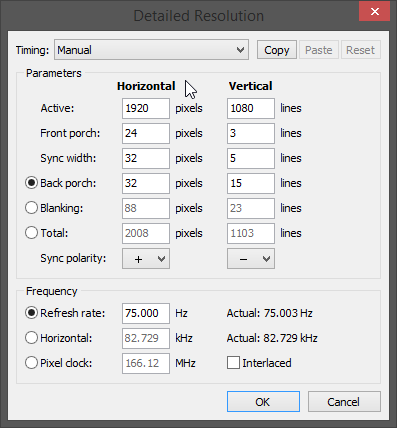 Understand how to edit numbers to make a "144Hz signal look exactly like a 240Hz signal with exactly the same Horizontal Scan Rate in number of scanlines per second". If you don't understand that concept, don't bother. Wink, Wink. If you can't simultaneously meet (A)/(B)/(C)/(D)/(E)/(F), it's not yet time to play with large VTs as a method of reducing input lag. 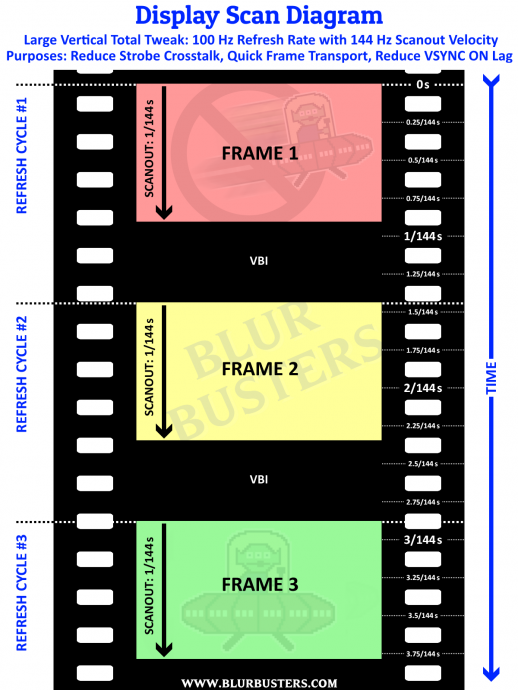 Also, monitors that support QFT but doesn't support VRR is extremely few and rare -- so the existence of VRR means there's often existing a much easier method of QFT aka frame rate capping (e.g. 60fps cap at 240Hz for low-latency emulation, which can be much lower lag than switching refresh rate to non-QFT 60Hz). Take your time to familiarize other simpler methods of reducing input lag, and slowly work your way to understanding how to make a fixed-Hz signal impersonate a FreeSync signal. (60Hz fixed-Hz at 1/240sec scanout non-FreeSync actually has nearly identical same signal structure as a perfect 60fps framerate cap on a 240Hz FreeSync VRR signal). That's why VRR frame rate capping is a much easier/simpler method of Quick Frame Transport. Some 75Hz non-FreeSync panels can do a 60Hz signal with a 75/60th acceleration factor. 1. Look at your 75 Hz mode. However, keep in mind a 75/60th acceleration factor (1.25x) will reduce your input lag only by (1/60sec) / (1.25) = approximately 3.3ms less input lag for screen bottom edge. (And half that for the lag reduction for screen middle -- e.g. approximately 1.6ms less lag for screen centre). This benefit is very conditional -- it is assuming you're using VSYNC ON rather than VSYNC OFF which bypasses scanout latency (making sub-refresh latencies possible, see http://www.blurbusters.com/scanout ....). ... Quick Frame Transport is mostly useless for VSYNC OFF except when the monitor is doing internal scan-rate conversion (e.g. buffering a slow-scanning non-QFT 60Hz signal for a fast-sweep scanout in 1/240sec on panels that are fixed-max-Hz scanout velocity, without real-time sync between cable scanout and panel scanout). Now you want Quick Frame Transport at your max Hz? Unfortunately, very few monitors I've run into can do large VTs at their max Hz, while also maintaining realtime synchronous scanout (cable scanout = panel scanout velocity). 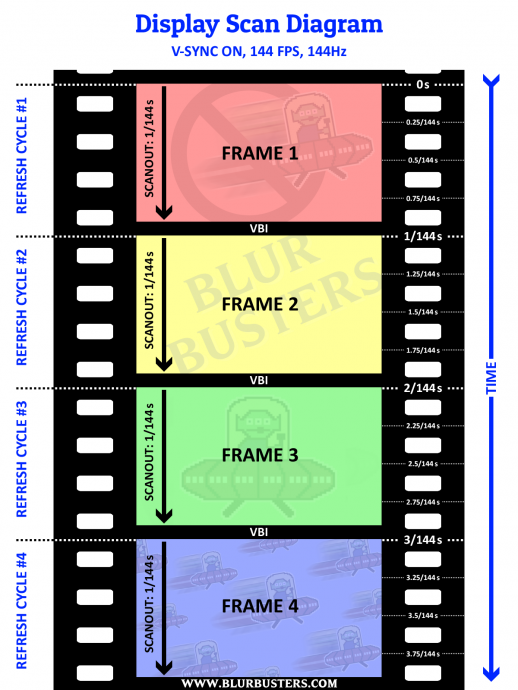 Eventually manufacturers will make QFT a simple checkbox toggle or such, but at the moment, doing a homebrew roll-your-own Quick Frame Transport (Large Vertical Totals) is a very advanced topic that is at the technical end of the Blur Busters educational venn diagram. TL;DR: Today -- at the moment -- it is much easier and much more successful to reduce lag of low refresh rates simply by using a frame rate cap on a variable refresh rate monitor, as your homebrew QFT refresh rate. (Getting a "Low-Lag 60Hz VSYNC ON" via a 60fps frame rate cap on a 144Hz or 240Hz FreeSync or GSYNC monitor). That's currently a much easier method of "defacto" Quick Frame Transport (QFT) than using Large Vertical Totals. Amazing reply! Thank you for clearing things up!